Nike C6 heart rate monitor is the next model up from the Nike C5 in the Nike Triax series. 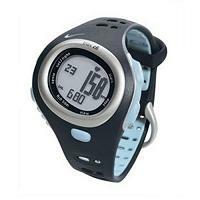 It is an intermediate heart rate monitor for general fitness training. Important Note: The Nike C6 is obsolete. Please take a look at the Sigma Sport PC 15, it has similar features. You can now do a test called the Personal Zone Finder to determine your own personalised zone limits for four intensities: Easy (Z1), Medium (Z2), Hard (Z3) and Very Hard (Z4). The results of the test become your own four heart rate training zones. You can override the limits manually if you wish. An audible alarm, if turned on, will beep when your heart rate goes from one zone to the other. You can see, while still exercising, how many calories you have burnt. You can also see, while exercising, a bar graph showing your heart rate during the past hour or so of your exercise. You see a number of bars with each bar representing your heart rate average for 2 minutes. Interesting! After the exercise, you can recall the total time, total calories burnt and the time you spent in each of your four training zones. Power Save feature: You can set the time after which the watch will go to sleep i.e. the display goes off. This saves battery life. You can easily wake the watch up by pressing any button. Note that the features in bold above show the features found in Nike C6 but not in Nike C5. The addition of the calorie counter to the Nike C6 heart rate monitor is a welcome addition for fitness enthusiasts and for those watching their weight. The Nike C6 has received great reviews on Amazon from its users. Reviews: This page has a concise summary of Nike heart rate monitor reviews. Further information: Visit Nike's official web site. Next one up in the Nike Triax series is the Nike Triax C8.